Cupcake lovers in Manhattan will be happy to hear that their sugar cravings can soon be satisfied 24 hours a day with new cupcake ATMs by Sprinkles Cupcakes. Set to be installed around Manhattan by this summer, the ATMs will dispense the irresistible treats all wrapped up in boxes and bags made from recycled materials. While their green attempt gets a thumbs up, we’re still left wondering if encouraging sugary snacking is a good idea. These delicious icing-topped cakes are a fun indulgence now and again, but not so much at one’s beck and call. With obesity levels and dietary illnesses as severe as they are today, it would be better to see ATMs like these stocked with healthier alternatives instead. The Manhattan-based bakery is introducing three of these gourmet cupcake automats in the city; located in midtown, downtown and the Upper West Side. These are expected to be installed right in time for the summer months, and each one will be stocked several times a day with hundreds of the cakes for people on the go. 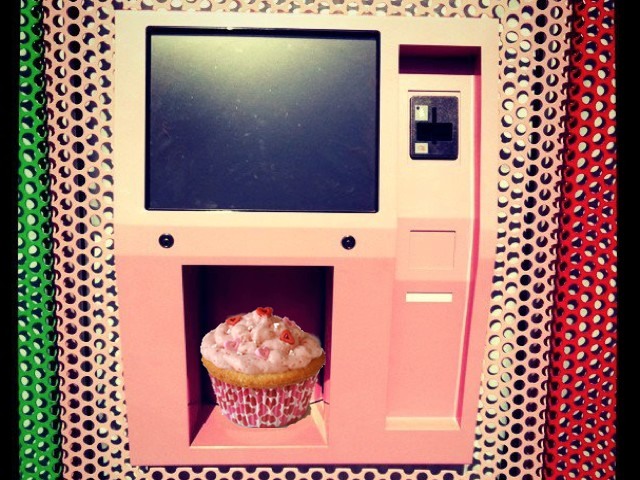 New York is a city known for an on-the-go supply and demand, and the cupcake ATMs will most likely be a huge success. While the model is certainly an interesting one, we hope that some of Sprinkles healthier temptations, or other more wholesome treats, like fresh fruit and natural drinks, make their way into the mix. Cakes don't usually come from vending machines, that's what. Who eats their cupcake with a spoon, though? In fact, if it's big enough to need a spoon it's no longer a cupcake, it's a bowlcake. Cupcake ATM? It's another way of saying cake vending machine. What is special about that?